A worksheet to assist children with pulling apart words into their letters, syllables and sounds/graphemes. Ideal to use as a literacy group activity. Children use the word detective pyramid to ‘pull-apart’ a word into its letters, syllables and sounds/graphemes. Print off a worksheet for each child or enlarge a copy to use as a whole class. Alternatively, print and laminate a class set for repetitive use with a removable marker. 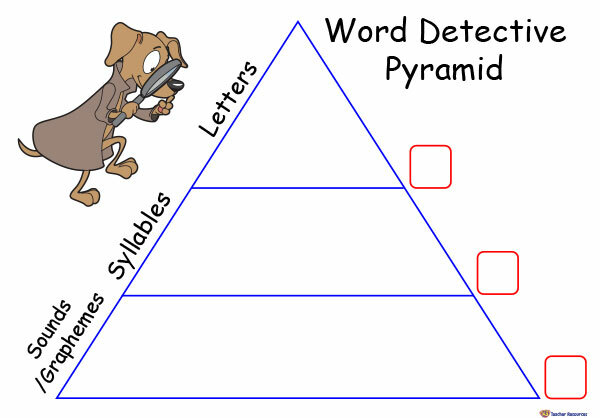 Ask students to use words from their weekly vocab/theme or spelling lists to complete the pyramid. Encourage the children to relate the sounds/graphemes ‘pulled out’ from each word to the phoneme/grapheme charts. What comes next? – For a challenge, provide students with a more difficult word list or use the sounds/graphemes row for children to find the appropriate grapheme tile and glue the word together using these sound/grapheme tiles and the bottom row as a guide.